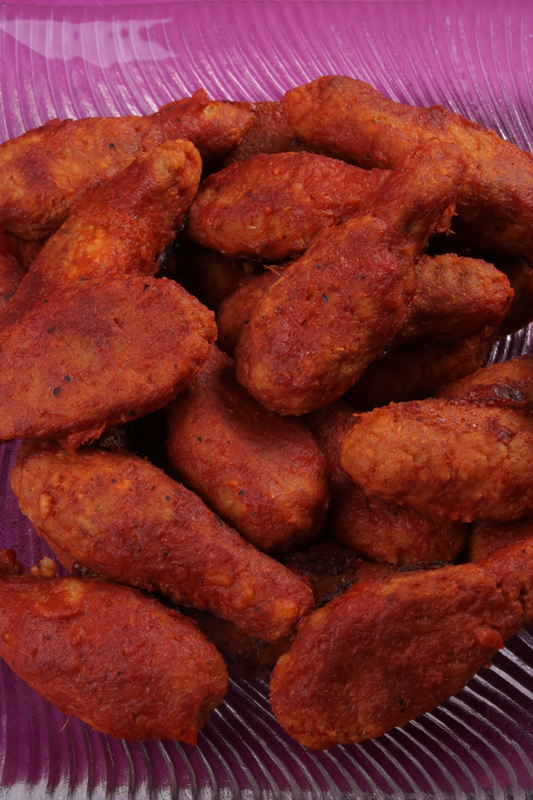 Vegan hot wings that are spicy, saucy and with a little bit of sweetness. The texture closely mimics that of a chicken nugget. These look really good and I’m planning on taking them to a picnic this weekend. Do you have a dipping sauce you recommend (I know that ‘wings’ are usually served with ranch dressing) or do you just eat them as is? I eat them as is but I am working on a faux blue cheese sauce for them but I haven’t quite gotten it yet. I have the base though, but the blue cheese flavor isn’t there yet. I don’t really think they need a dipping sauce though, the sauce that’s on them is so good. Hey – finally trying these wings. I’m excited as hell cuz they look delicious. They are in the oven now. Josh, what’s the deal about isolated soy protein? I’ve tried to google it, but haven’t found enough info to make informed decisions about it or to relaly know what foods it’s found in. Also, have been trying my luck with making my own seitan from vital wheat gluten (hoping to save money that way). First attempt: not so good. Too, bread-y, I guess. Any suggestions? Oh and I’ve never made my own seitan, so I don’t know anything about it. Also is the mustard in this recipe the powdered kind or the prepared gooey kind? I will not shape them as wings, though, since I prefer not to think about chickens as I eat these–might spoil my appetite. Hey, Josh. I’ve been wanting to try these but both my sister and I have an allergy to pineapple. Is there anything I could substitute for it? I’m at a loss. Jessica, maybe some orange marmalade? Hey I made these and they were delicious!!! Thanks so much for the recipe, i put the picture on my tumblr if you wanna see how mine turned out. Awesome! I’m excited to try some of your other recipes- thanks for sharing!! these are so worth the process of making them!! the sauce is amazing! we made them last night and i just had a couple cold from the fridge for breakfast.. we also whipped up a little “ranch dressing” to dunk them in. so thankful for this recipe! If you were going to make some vegan hot dogs, what would you put in them for the flavor? Have you ever tried to make any? I have been working on a hot dog like recipe and old bay seasoning seems to be a good flavor. These have been very successful for me and I’ve made them with soya beans as well as chick peas. If I leave out the hot stuff and make them into torpedoes (himself doesn’t like food that looks like meat) he raves about them. Excellent cold, too, so very useful for a picnic or packed lunch. A big thank you. In the recipe it calls for 2/3 a block of extra firm tofu. At the store, the blocks come in two sizes. Which size should I get? Thanks! I’m going to try this tomorrow! I’m new to the whole Vegetarian thing, but I’m just thrilled by the prospect of being able to make my own meat replacements (especially since the store bought ones are not all that great and expensive to boot!) I tried making these wings today and they were pretty good. I suspect I left a little too much liquid in the tofu, so they were a little softer than I would prefer, but still they hit all those meaty satisfaction notes one expects. I can see myself happily eating like this for the rest of my life! (my family also has a history of heart disease as well) Thanks for sharing all these recipies! I was wondering about the vegan butter. Where I live it’s nowhere to be found. Do you have some recipe so I can make it myself? or perhaps some idea of a substitute? Danielle, try olive oil, that should work. Even when I ate meat I wasn’t really into the whole “hot wings” idea (they kinda gave me the creeps to look at, even as a carnivore), but these look delicious! I’m not usually scared of a little heat, but my husband tends to get heartburn if things are too spicy. I just got some chipotle powder, but have never cooked with it before, and I’ve never used cajun seasoning before because of my husband’s low heat tolerance. Which one is spicier? Could I leave the spicier one out and the sauce still come out okay? Or do you have a mild version you could recommend? Thanks in advance! Love your recipes! I made these for the Superbowl today! They were very yummy! I found that mixing it all together with a pastry blender made it very easy to mix evenly. Finally got around to making these for me and my heartburn-prone husband. They didn’t bother him a bit! I’d love to try slathering BBQ sauce on them. Do you think they’d cook well as a patty, like a BBQ “chicken breast”? Also, have you tried freezing the mixture, or at least refrigerating it a while? I’d like to keep some on hand for quick and easy suppers, but didn’t know how well it would keep.